Most unsecured business loans are paid back on time with little hassle. Many of us will go years without missing a payment on all types of online business loans. That doesn’t mean you don’t need to know what happens if you default on an unsecured business loan. Although we all intend to pay back the money we borrow, sometimes the inevitable happens and we are left making some tough choices. If you find yourself unable to repay any of your small business loans, it’s important to understand what is going to happen and take advantage of every opportunity to address the issue. As always, we don’t want our readers to take this information as legal or financial advice. We’re not experts on this topic and it’s always best to consult with an attorney or financial specialist if you’re in danger of defaulting on any type of financing. A secured business loan is something that is tied to a specific asset. A mortgage or car loan are good examples. These types of loans have a clause in them that, in the event of a default, the owner of the loan can claim or repossess your property. An unsecured business loan is not tied to a specific asset, but this does not mean that they will not be able to go after your assets. When you know you are going to be unable to repay your unsecured business loan, be sure to assess your options. Contact the lender and see about refinancing. It is possible you may be able to negotiate a longer term, reducing your payments. If you have been paying your loan on time so far, you may also be able to seek financing from another party to cover your debt. Remember that defaulting on this loan could obliterate the credit score you have spent years building. Even accepting a loan with a higher interest rate is favorable to default. If you are unable to avoid default or find alternate financing, be prepared for a lawsuit. This is the only way the lender can get the legal authorization to collect on the loan. The process can move pretty swiftly. Lawsuits are extremely expensive, and the lender will want to avoid it just as much as you want to repay your unsecured business loan. Use this as a final opportunity to negotiate with the lender and find terms that suit both your needs. If you are unable to negotiate, your costs can increase drastically. The lender is allowed to seek not only the value of the defaulted small business loan but also all of their costs associated with the lawsuit. As the lawsuit proceeds you are entering into the complicated territory of defaulted unsecured business loans. It is vital that you have an experienced lawyer to help you navigate the process of defaulting on online small business loans. This is your legal right. Although a lawyer may be appointed to you at no cost if this is a high-value loan it is definitely worth hiring somebody who has experience with finance. Check the yellow pages or contact the bar association to find appropriate legal counsel. Upon obtaining a judgment, the lender has many avenues they can explore to recover the unpaid balance of their unsecured business loans. The first thing to establish is if you co-signed the loan. Many small business loans require you to sign as a guarantor. If you did, this means that your personal assets are also at risk. If you have a car, a home, or other valuable assets these may be liquidation risks. You may have some control in this situation, so be sure to exercise it appropriately. For example, if you do not want to risk losing your house try to sell as many smaller assets as possible to pay off the small business loan. It’s favorable to sell your car and use the cash to pay your loan, then it is to have them seize the car and auction it off. Bank auctions are usually positioned or a quick sale and don’t always procure the book value of the asset. 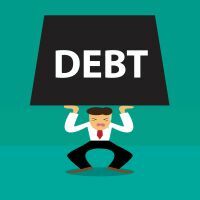 If a judgment collection has been levied and you do not have enough assets to pay the fine, you may be forced to file for bankruptcy. Because businesses are separate legal entities from individuals, the types of bankruptcy they are able to file will be different. Chapter 11 bankruptcy is the most desirable method. This allows you to open up an avenue of communication with your creditors regarding your online small business loan. You first disclose your financial position and recommend a way that the business could be restructured to pay off your debts. The creditors are then able to make an informed decision as to whether they should accept your proposal or not. Remember that this is essentially their last shot at receiving any payment for a defaulted unsecured business loan. They may prefer to have you stay in business and pay the small business loan over time. In the event that your business is completely insolvent and has no profits, the chapter 11 proposal will probably fail. The next step after this is chapter 7, where the corporation or proprietorship ceases to exist. When this happens you will wipe yourself of most obligations that are of a financial nature. Please consult with a tax specialist of attorney that specializes in business litigation. There’s never an easy answer when discussing a possible default on small business loans. Do all the research you can and most importantly speak with an expert.